Hudson Valley for No GMOs: Do We Save the Monarch Butterfly or Monsanto's Profits? 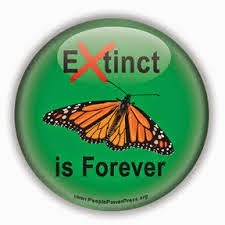 Do We Save the Monarch Butterfly or Monsanto's Profits? Ninety percent of our beautiful monarch butterflies have been wiped out, yet it is still has not been listed as an endangered species. Monsanto says doing so "makes for a great news headline" but will fail to "help solve the problem". Wrong! Listing them as endangered would make it illegal to destroy the monarch's habitat which Monsanto is now doing with its Roundup Ready soy and corn crops that cover over 150 million acres in the US. Such crops are genetically engineered to withstand massive doses of Roundup (glyphosate) which kill the milkweed plants the monarch depends on for survival. Since the introduction of GM crops, pesticide use is up over 400 million pounds in our country. Glyphosate has proven to be much more toxic than originally thought and is now found in our air, rainwater, waterways, and in us- it has even been found in mother's breast milk. Genetically modified seeds are also coated with neonicotinoids which are killing bees. If we kill the pollinators we are killing ourselves. GMOs have to rely more and more on higher levels and more toxic types of pesticide because of the emergence of super weeds and super bugs. GMOs are not sustainable; they are poisoning us all. The beautiful monarch butterfly, which is also a major pollinator, is being threatened by herbicides that eradicate milkweed, its primary food source. Now, a desperate rejuvenation program is under way to save the species from possible extinction. A shocking statistic released by the US Fish and Wildlife Service on Monday summed up the plight of the monarch butterfly: Since 1990, about 970 million of the butterflies – 90 percent of the total population – have vanished across the United States. The massacre provides a grim testimony to the delicate balance that exists between man and nature, and how the introduction of a single consumer product – in this case, Monsanto’s Roundup Ready herbicide – can wreak so much havoc. Sold to farmers and homeowners as an effective method for eliminating milkweed plants, Roundup Ready, introduced in the 1970s, is widely blamed for decimating the monarch butterflies’ only source of food in the Midwest. “This report is a wake-up call. This iconic species is on the verge of extinction because of Monsanto's Roundup Ready crop system,” said Andrew Kimbrell, executive director for the Center for Food Safety, which last week released a report describing the effects of herbicide-resistant crops on monarch butterflies in North America. The widespread death of the monarch butterfly has prompted some groups, like the Center for Biological Diversity, to demand the butterfly be placed on the endangered species list. Dan Ashe, director of Fish and Wildlife Service, preferred to take a diplomatic approach to Monsanto’s hefty contribution to the problem, saying everyone is responsible for the plight of the monarch butterfly. “We’ve all been responsible. We are the consumers of agricultural products. I eat corn. American farmers are not the enemy. Can they be part of the solution? Yes,” Ashe said. The monarch migrates annually thousands of miles - and over the lifespan of many generations - from Mexico, across the United States, to Canada. To complete this migration, the butterfly is dependent upon the milkweed plant, which provides not only a major food source, but a larval host. However, as US farmland continues to eat up the remaining wild places, there appears to be little left to sustain the monarch. In an effort to restore monarch numbers, the US Fish and Wildlife Service has teamed up with the National Wildlife Federation and the National Fish and Wildlife Foundation to start a milkweed replanting program. The Fish and Wildlife Service said it will contribute $2 million this year to restoring more than 200,000 acres of monarch habitat, while also “supporting over 750 schoolyard habitats and pollinator gardens.”The service will also concentrate rejuvenation efforts on Interstate 35, a 1,568-mile (2,523 km) highway that extends from Texas to Minnesota, which closely follows the monarch’s migration path. “We can save the monarch butterfly in North America, but only if we act quickly and together,” said Ashe. The monarch butterfly is not the only pollinator species suffering from the agricultural use of pesticides. Wasps, beetles and especially honeybees have all experienced significant drops in their numbers over the years, which will have adverse effects on America’s crop supply if not soon addressed. Monsanto has run into controversy before over its glysophate-based Roundup Ready product. It is even being blamed by some for a sharp spike in suicide rates among Indian farmers, many of whom could not afford to continue buying the Ready Roundup seeds and herbicides. Monsanto denies that its seeds have contributed to the plight of Indian farmers. “Despite claims by those who oppose GMO crops, research also demonstrates there is no link between Indian farmer suicides and the planting of GMO cotton,” the company said on its website. However, since Monsanto controls about 95 percent of the cotton seed market in India, many small farmers are falling behind on their debt, leading them, critics claim, to desperate measures. “Two hundred and eighty-four thousand farmers have committed suicide in India because of debt linked to seed and chemicals,” Vandana Shiva, an Indian environmental activist and anti-globalization author, said last year ahead of the March Against Monsanto global protests. Last year, hundreds of thousands of people united around the world to raise awareness over the biotech giant Monsanto’s growing grip on the global food supply chain. Activists on five continents around the globe, comprising 52 nations, joined the fight under the March against Monsanto umbrella.